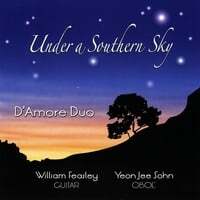 "Under a Southern Sky" is the latest release by William Feasley, guitar and Yeon-jee Sohn, oboe - known collectively as the D'Amore Duo. Hailed as a "perfect partnership of sound" by the Washington Post, the duo's latest release features new music especially composed for them by award winning Brazilian guitarist/composer Marcos Vinicius, Argentine tango masters Claudio Bruzzese and Marcelo Ferraris and American Composer Richard Greene (from Millegeville Georgia) - all with a distinctive southern vibe! Also featured is a recently rediscovered work for oboe and guitar, the Cavatina op. 57, by the romantic French guitarist Napoleon Coste, a Choros by Waldir Azevado, Uirapuru (a Brazilian Fantasy) by Tom Eastwood and a samba by the great Antonio Carlos Jobim.